I love Skinny Stuffed Baked Potatoes. 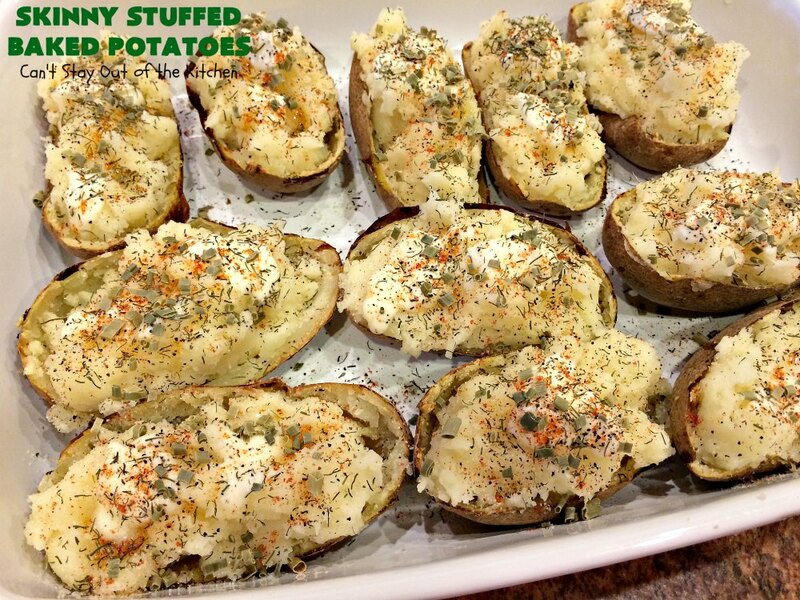 I think these are one of my favorite ways to eat potatoes. This simple recipe is just potatoes, butter, a little milk and spices for the most part. And yet, the spices and herbs I use on top of the stuffed potatoes are what make these potatoes so special. After baking the potatoes I carefully scoop out the potatoes leaving a little attached to the shell. Then I mash the potatoes with butter and 2% milk. I pile the potatoes back into the shells and then put a dab or two of butter on top of each potato. Then I sprinkle the tops of the potatoes with paprika, dill weed, garlic salt, pepper, and chives. Sometimes I add parsley, and sometimes I also add salt. Oh, my. These potatoes are savory, succulent, and spectacular. Yet, so very simple, too. You wouldn’t think dill weed and paprika would provide such outstanding flavor, but they do. 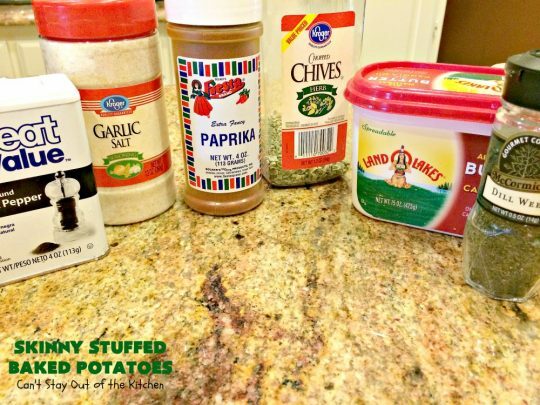 I love making potatoes with this combination of seasonings. I’ve baked them in the oven as fries, mashed them for a casserole, and make them as Fried Potatoes. I’ve also made them with Scalloped Potatoes using red potatoes. You just can’t beat this combination of spices. I’m sure Au Gratin potatoes would be great with these spices included as well! 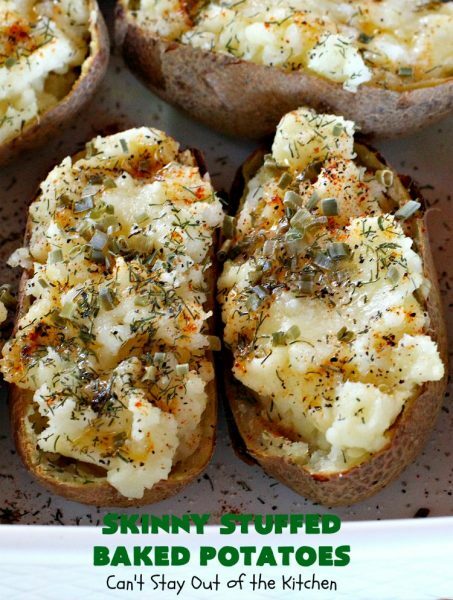 This is an easy, tasty and healthy version of Double Baked Potatoes. It’s also gluten free. The recipe can easily be made vegan if you substitute Almond Milk and coconut oil for the milk and butter in the recipe. 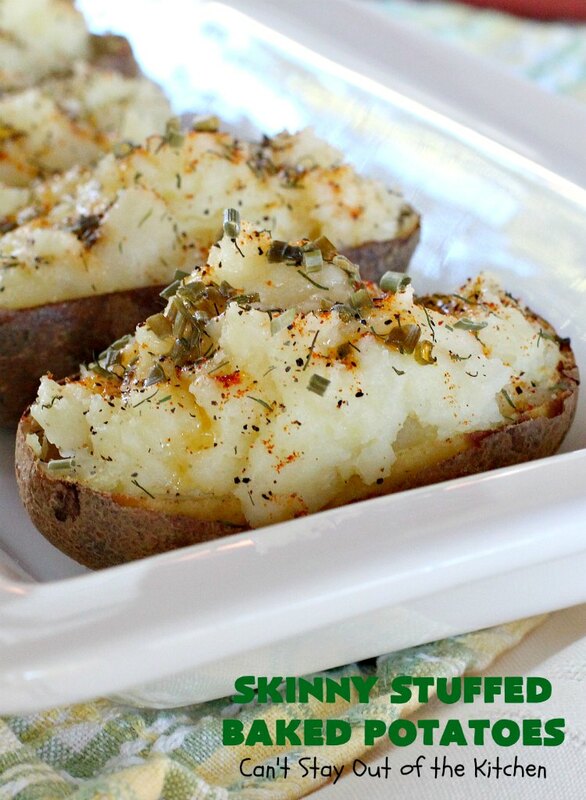 It’s a lot healthier and a lot less calories than most Stuffed Baked Potato recipes. Those are made with all the goopy, calorie-laden fillings like cream cheese, sour cream, cheddar cheese, bacon, chili, and Ranch dip, etc. Those recipes sure taste great. But it’s nice to have a go-to recipe to eat on occasion when you want lots of flavor without all the calories. Skinny Stuffed Baked Potatoes provides a healthy and much lower calorie adaptation of an old favorite. It’s topped with several delicious herbs to provide flavor and color, rather than cheese and bacon. I first experimented with this combination of flavors back when I was catering for the Baptist Convention of New England in the early 1990s. Carolyn Allen, my partner, suggested I try using dill weed in recipes more often. So that is where this combination of herbs and spices came from. I’m very grateful to her for the tip because I’ve used dill weed and paprika together in many dishes since including soups and casseroles because the flavor combination can hardly be beat. I originally posted this recipe back in the summer of 2012. I was new to the blogging world and my pictures weren’t quite up to par. I remade the recipe in October 2014 and updated it with some better looking pictures. These pictures are a lot easier to view than the ones from my first post. I’ve really tried to improve my photo taking skills over the past year, but it is a process! 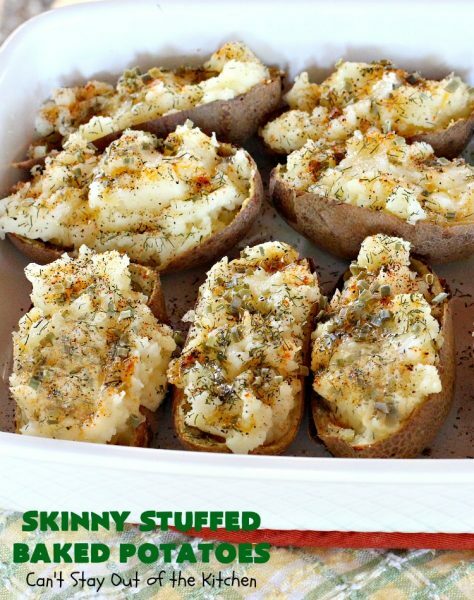 I have used this delicious recipe to make Skinny Stuffed Baked Potatoes as written. 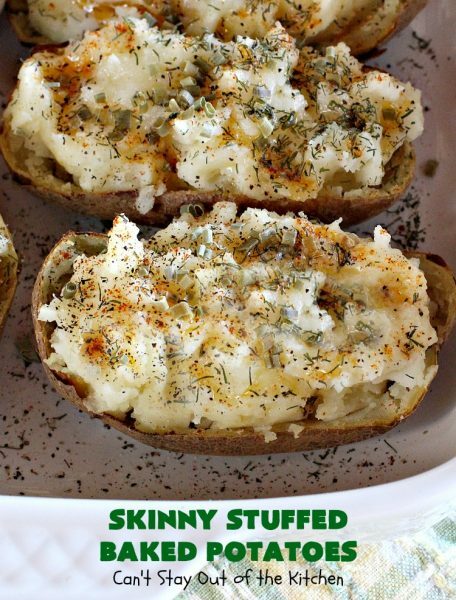 I also use this recipe on occasion by making a mashed potato casserole and adding the same herbs on top. Either way the recipe is delicious, satisfying, low calorie, and a great comfort food for your family. Whip up a batch sometime soon and you will see what I mean. Skinny Stuffed Baked Potatoes are awesome! It’s so nice to eat comfort food that isn’t laden with calories! 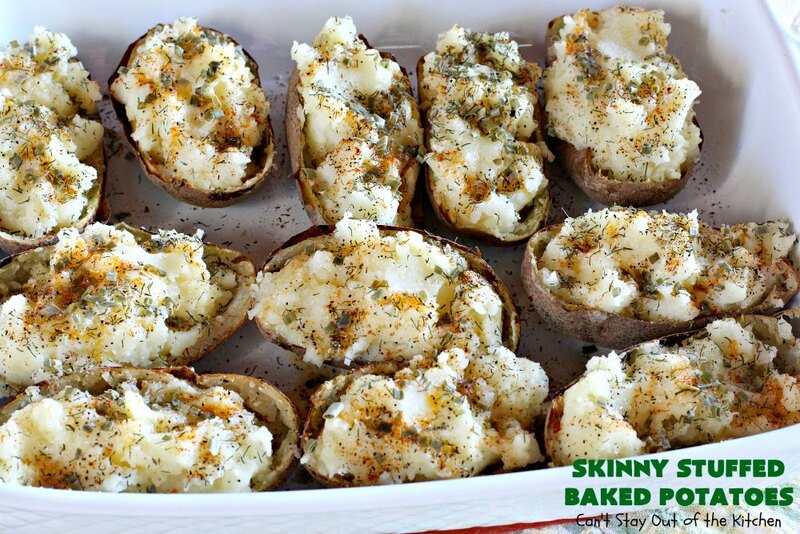 This is a close up view of Skinny Stuffed Baked Potatoes so you can see the detail of the spices. I use garlic salt, pepper, paprika, dill weed, parsley and chives, along with butter. 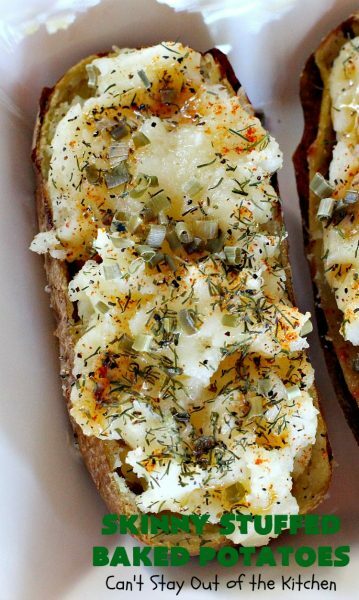 The paprika and dill weed add so much extra flavor to these delicious potatoes. It’s a fabulous combination of flavors. 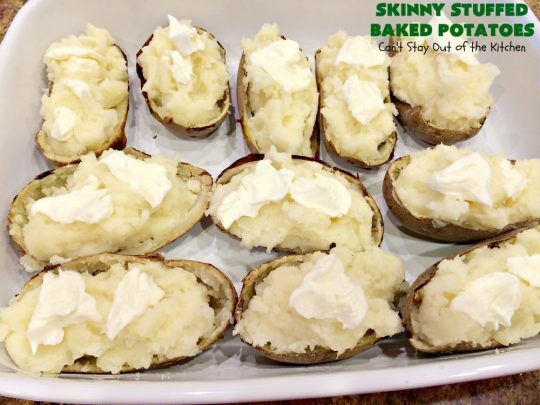 Skinny Stuffed Baked Potatoes are so scrumptious it’s hard to believe they’re so much lighter in calories than stuffed potatoes with cheese, sour cream, bacon and butter. Slice each potato in half lengthwise. Hollow out the potato leaving a thin layer of potato next to the skin to provide body. Place the scooped out potatoes into a mixing bowl. 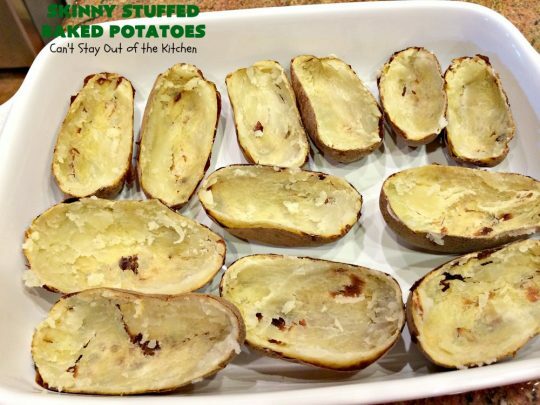 Place hollowed out potato skins in baking dish. I always add more potatoes than I’m going to use and throw a few of the shells away. This ensures there is plenty of potato to pile high into the shells. Mash up the potatoes with a potato masher until mashed well. They do not need to be super smooth. You want some texture to the potatoes. Add butter. You can melt it first since that’s easier, or just let it melt over the hot potatoes like I did and work the butter into the potatoes. You don’t want too much butter or the potatoes taste oily. Add milk just like you would for any mashed potatoes recipe, depending on the amounts you have. Don’t add too much milk or the potatoes will be soupy. 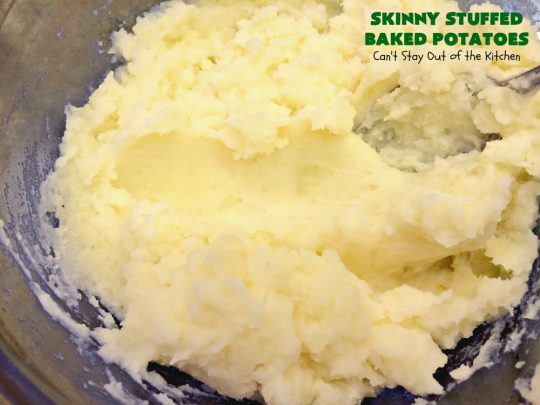 You can use and electric mixer if you have to have perfectly smooth potatoes. We prefer the texture of potatoes not entirely smooth since that’s how I grew up eating them. So I only use the potato masher. My mom didn’t have an electric mixer until the late 70s or 80s, I think. Back in those days you used a hand-held rotary mixer which most people these days have probably never even seen! 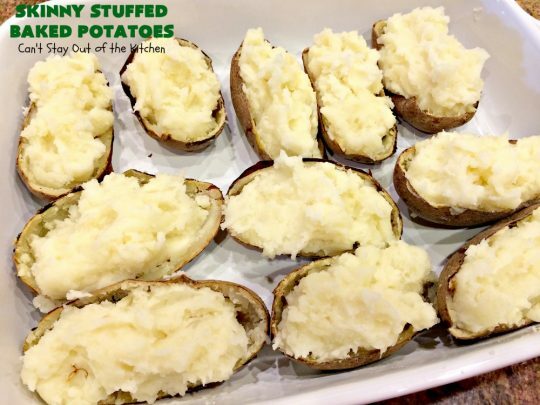 Pile mashed potatoes into potato shells. These are the seasonings I use. The dill weed and paprika are what make these potatoes taste so wonderfully. I urge you to try it with all the seasonings first, before dismissing the idea because it sounds weird or because you’ve never done it that way before. It’s a beautiful combination of flavors. Most of the time I also add parsley and salt. Dab the tops of the potatoes with butter. Sprinkle generously with all the seasonings. Place in a 350 oven and allow butter to melt–five or ten minutes at most. Wonderful! Skinny Stuffed Baked Potatoes are so much lower in calories than most Stuffed Baked Potato recipes. Yet they have such a scrumptious taste. They’re quick and easy to make, too. Thanks to Carolyn Allen for encouraging me to use dill weed in recipes. Wow, does it make this recipe so much better. This is a great side dish for any kind of meat, but I actually like to eat the leftovers for lunch–just like they are. Yum, yum, good! Skinny Stuffed Baked Potatoes are kid-friendly, too. 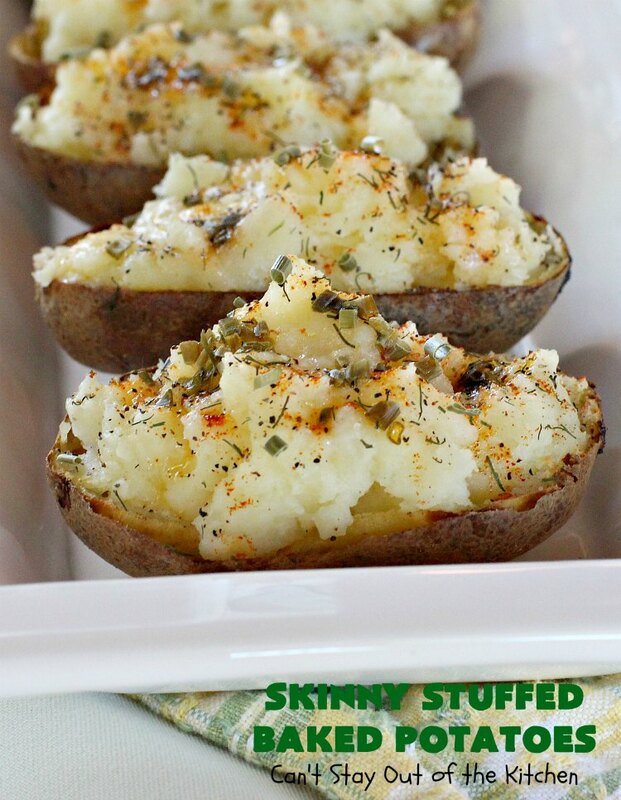 They really enjoy these flavorful, savory potatoes. Whenever I’ve served this dish for company (which has been many times over the years), everyone has always wanted two or three of these potatoes! These scrumptious double baked potatoes are seasoned with several spices and butter. 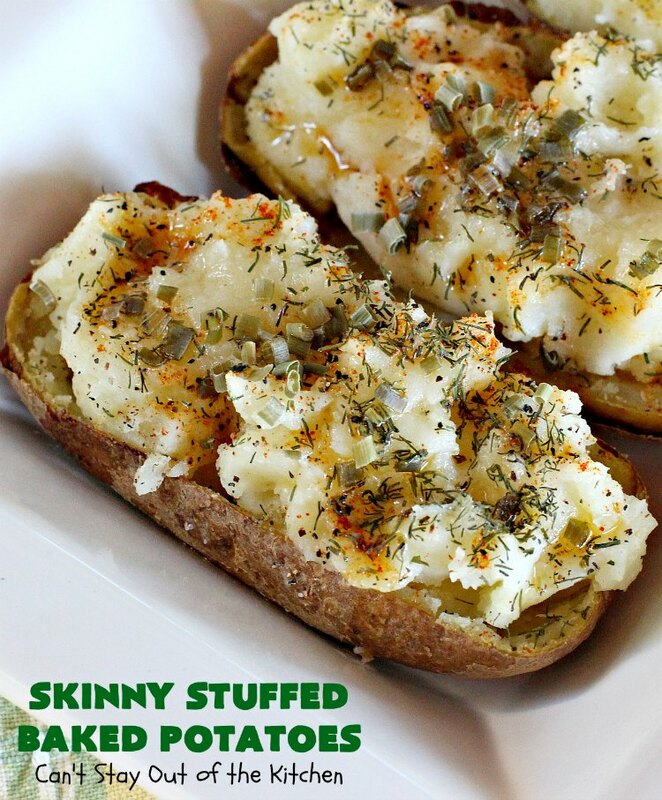 They are much lower in calories than traditional loaded baked potatoes and, yet, the taste is amazing. Perfect for company or holiday dinners, like Easter, Mother's Day or Father's Day. Gluten free. Bake potatoes in 400 degree oven until done--about an hour. 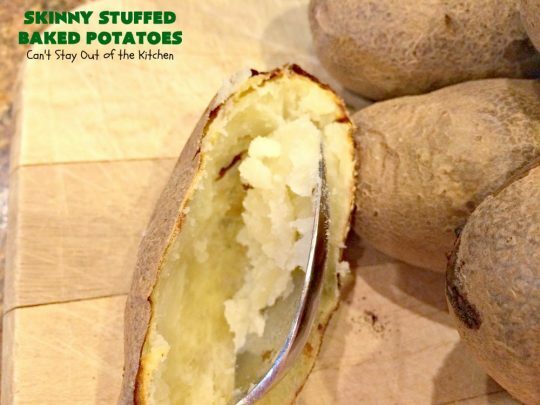 Cut potatoes in half with a large knife and hollow out insides. 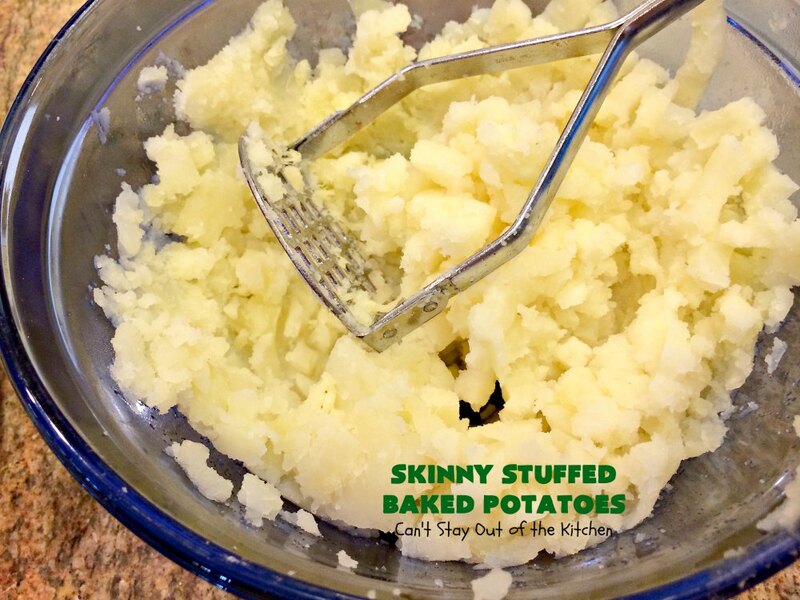 Put potato pulp in large bowl. Add about a 2-3 tbsp. butter while mashing. 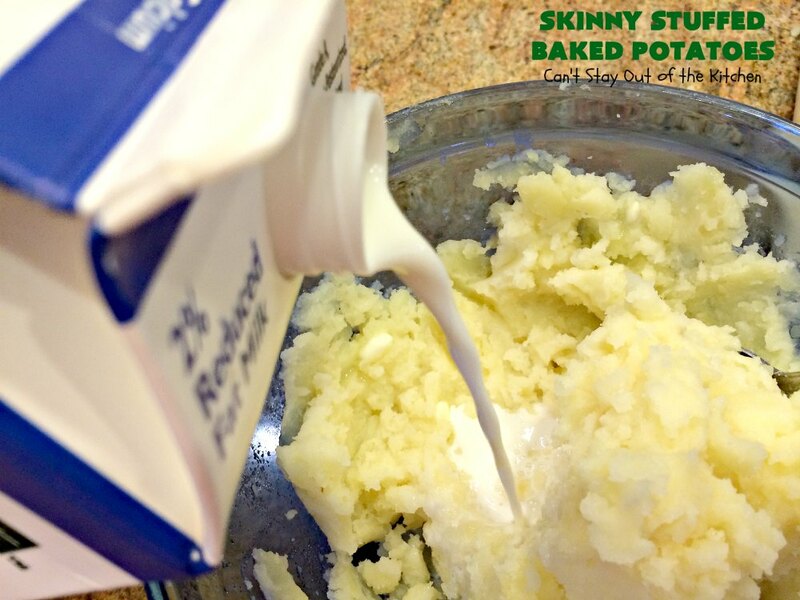 Add enough milk to make creamy without making soupy or leaving potatoes too dry. Pile mashed potatoes back into shells. With remaining butter, put a small slab of butter on each one. Then sprinkle generously with paprika, garlic salt, dill weed, pepper, parsley, and chives. Bake at 350 degrees an additional 5-10 minutes until butter melts. NOTE: These measurements for spices are approximate and a guide only. I just sprinkle the spices on to my preference. You can use more or less. You can also use salt, if desired. NOTE: A lot of times I will use up small and weird-shaped potatoes to use as filler for the bigger potatoes, so the amount of potatoes is approximate. NOTE: You can also make these in casserole form. 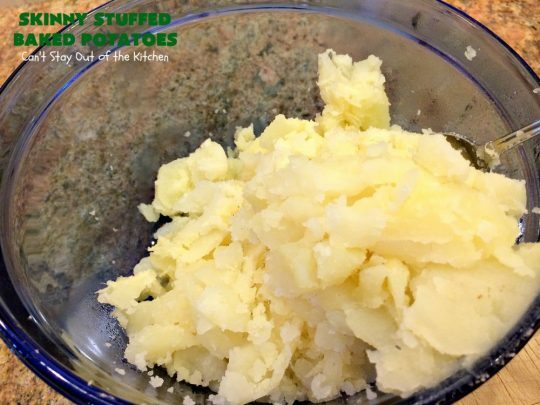 Try my Seasoned Mashed Potatoes, Seasoned Oven Fries or Seasoned Scalloped Potatoes. These scrumptious double baked potatoes are seasoned with several spices and butter. They are much lower in calories than traditional loaded baked potatoes and, yet, the taste is amazing. Gluten free. Bake potatoes in oven until done. Bake an additional 5-10 minutes until butter melts. Can be done ahead to the point where the potatoes are ready to go into the oven. Place in oven and bake about 15 minutes before everything else is ready to come out of the oven. If potatoes are cold you may have to heat them 30-40 minutes. [br][br]These measurements for spices are approximate and a guide only. I just sprinkle the spices on to my preference. You can use more or less. You can also use salt, if desired. [br][br]A lot of times I will use up small and weird-shaped potatoes to use as filler for the bigger potatoes, so the amount of potatoes is approximate. [br][br]You can also make these in casserole form. 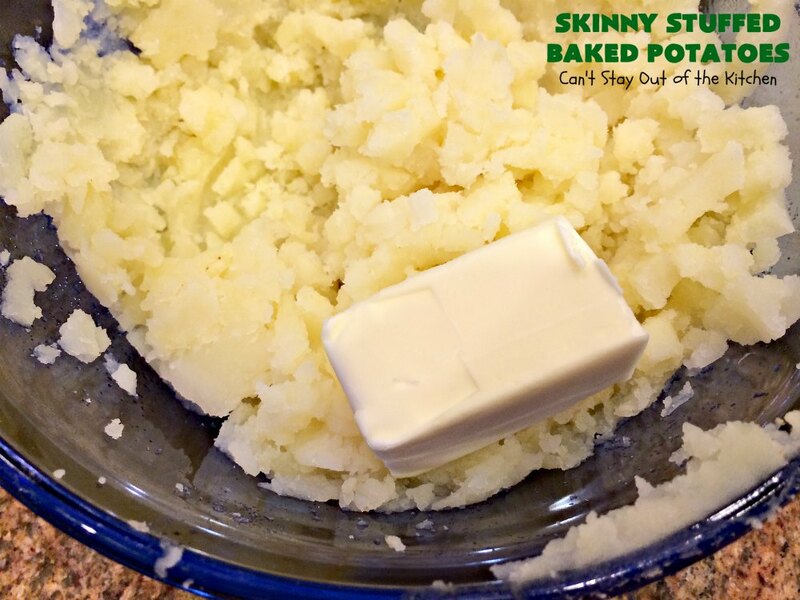 Try my [url href=”http://cantstayoutofthekitchen.com/2014/10/21/seasoned-mashed-potatoes/” target=”_blank” title=”seasoned mashed potatoes”]Seasoned Mashed Potatoes. [/url][br][br][br]Preparation time does not include the time required to bake potatoes. Skinny Stuffed Baked Potatoes is a marvelous side dish your whole family will enjoy. 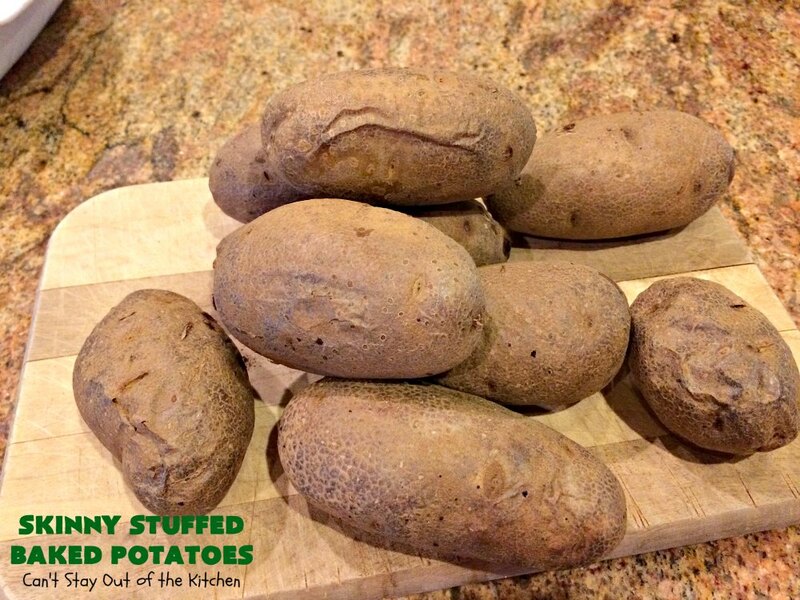 I especially like serving these potatoes with Meatloaf, but they’re great with Apricot Glazed Ham, Parmesan Chicken Bake, and New York Strip Steak with Garlic Parsley Butter. Don’t these potatoes look marvelous? 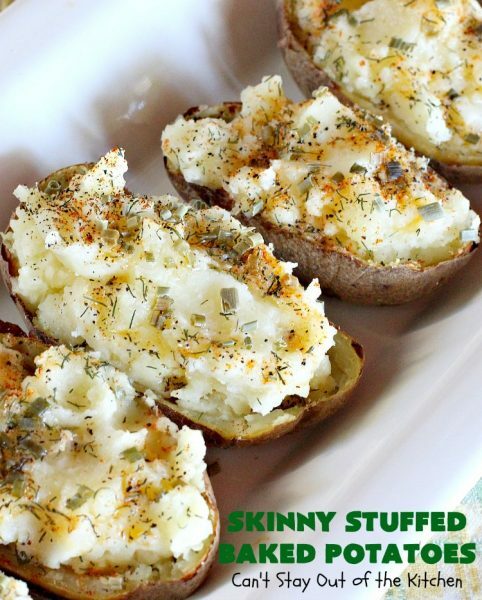 Skinny Stuffed Baked Potatoes are a tasty and savory indulgence that won’t pile all the pounds on the scale! These look easy, low cal, and I love dill. Am cooking on New Year’s Eve and trying this recipe! Hi, Dorothy. We love this recipe. It’s so tasty. The seasonings work so well together. Enjoy. They really are delicious – the spices are what really make this. Don’t be afraid to try the dill and paprika – they taste absolutely fabulous on potatoes.